We want to send out a huge “thank you” to everyone who participated in our Shelter Sweethearts Photo Contest! We’ve chosen 6 winners and are preparing to send checks totaling $8,000 to shelters and rescues. Whether you submitted a photo or simply voted, we greatly appreciate your participation and your help in making the contest a success. Even if your local pet shelter or rescue didn’t win a donation through our contest, you can still help them out by promoting the “give local” message in your community. Volunteer your time or donate what you can, and make sure that others know to do so as well. Many people give to national groups like the Humane Society of the United States but don’t know that little of the money, if any, will make it to their local shelter. With your help, pet shelters and rescues can have the resources they need to continue their important hands-on work. 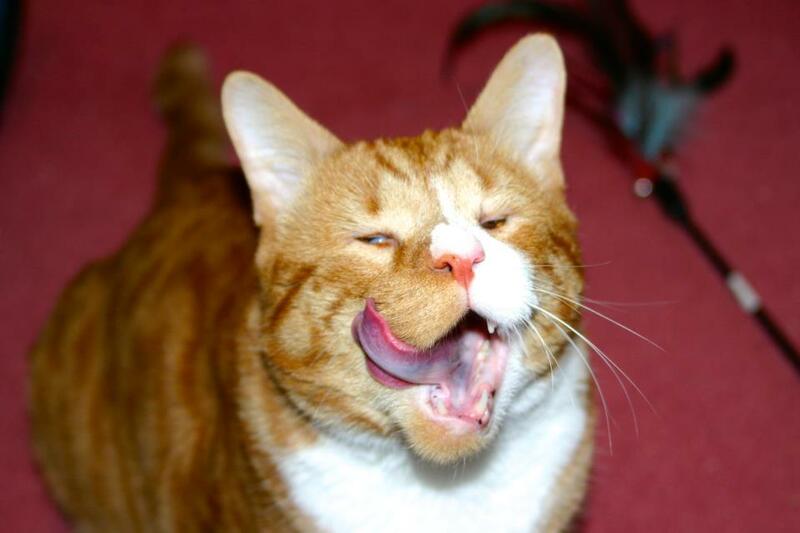 About Mr. Magoo: Mr. Magoo is a 2 1/2 year old blind specially-abled cat that we rescued from euthanasia in October 2012. Magoo was picked up by animal control as a stray wandering the streets of Philadelphia. Unfortunately with him being sick and blind his time was up. Magoo is adventurous, loving and so full of life, he never let’s his blindness hold him back or get in his way. Magoo has become an animal advocate for specially-abled animals and raises awareness and funds to help other animals like himself. His mission is helping others to understand that Specially-abled animals are no different than other pets, they just need love, compassion and a place to home. Paying it forward wasn’t an option it essential. We fell in love with his face, but he has truly stolen our hearts. — Colleen K.
About Freida: Freida was found in a ditch on April 10, 2013 one mile from anywhere…a certain throw away kitty. 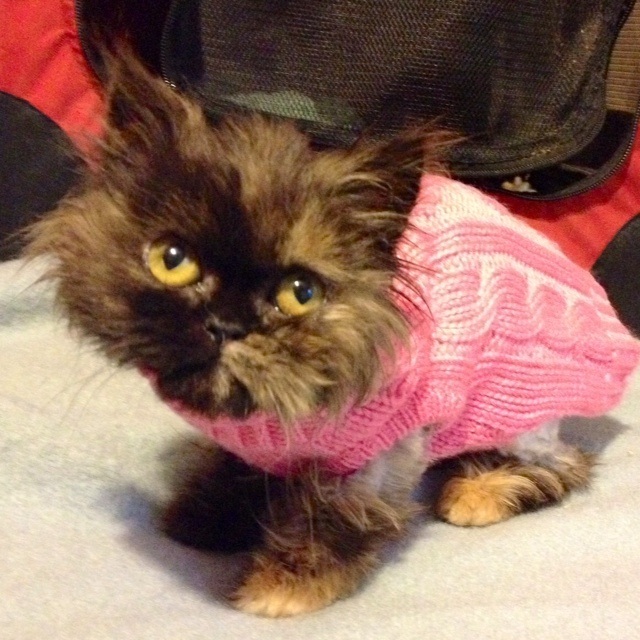 She was emaciated and matted and weighed less than 2 lbs. She did not walk to that ditch by herself. Thank God for the man taking a walk that day. He saved her life. Freida was scared. We took her to the vet who was a perplexed as we were at the matted kitty with two wide eyes starring up at us as if to say, “Help me.” The vet had to shave her and due to her lack of body fat Freida began wearing sweaters to keep warm. After much testing and many exams by vets and specialists we do know that Freida has food processing issues, liver and gallbladder issues and battles with chronic infection. Her white blood cell count remains off the charts. About Sweet Sadie: Sweet Sadie was found as a stray with a severely broken jaw. She went in for emergency surgery that same day and we found it had been left so long she had formed a bad infection which required several strong antibiotics. It took her weeks to heal, but during that time she showed her loving side. She wiggled her way around the vets office and would sit, shake, and wait for a treat! Once healed, she moved into a loving foster home that has taken great care of her. We cannot imagine what happened to this girl’s jaw, but we know that she has learned to love people once again. This girl has wiggled her way into my heart, and I know she will wiggle her way into the hearts of everyone else! — Danielle S.
Roo is a beautiful girl with a BIG personality. She is loving and friendly, and has a happy disposition even though she has been in boarding for quite a long time. Roo would love to have an active owner – someone who needs an exercise buddy, someone to jog with and go on long walks with, as she is full of energy. She is also smart and fearless – definitely try her in agility – we think she’d love it! She is picky about her canine friends. She is definitely a dominant personality to other dogs, so the BEST home for her would be one where she could be the only dog. We know her perfect home is looking for her right now!